VIENNA – Daily treatment of patients with nonalcoholic steatohepatitis with obeticholic acid led to a near doubling of patients who had fibrosis regression in a phase 3 trial with 931 patients, making obeticholic acid the first agent proven to improve the course of this disease. 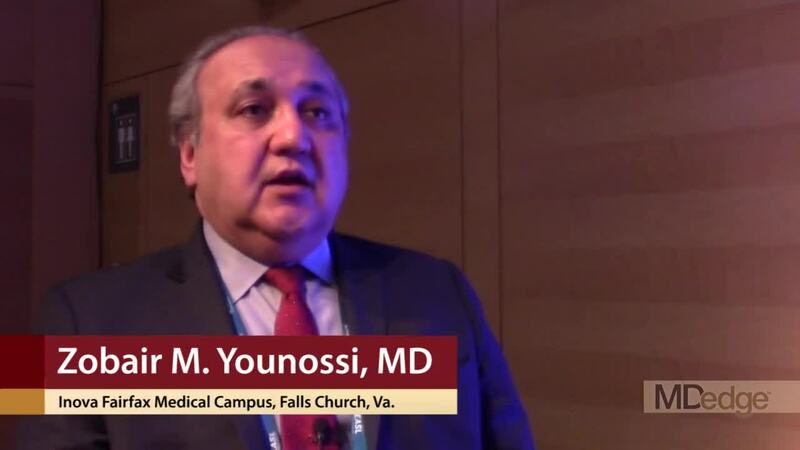 “There is no doubt that with these data we have changed the treatment” of nonalcoholic steatohepatitis (NASH), Zobair M. Younossi, MD, of Inova Fairfax Medical Campus in Falls Church, Va., said at the meeting sponsored by the European Association for the Study of the Liver. “We are at a watershed moment” in NASH treatment, Dr. Younossi added in a video interview. Until now “we have had no effective treatments for NASH. This is the first success in a phase 3 trial; obeticholic acid looks very promising,” commented Philip N. Newsome, PhD, professor of experimental hepatology at the University of Birmingham (England). Obeticholic acid (OCA), an agonist of the farnesoid X receptor, already has Food and Drug Administration marketing approval for the indication of primary biliary cholangitis, a much rarer disease than NASH. The REGENERATE (Randomized Global Phase 3 Study to Evaluate the Impact on NASH With Fibrosis of Obeticholic Acid Treatment) trial has so far enrolled 931 patients at about 350 sites in 20 countries, including the United States, and followed them during 18 months of treatment, the prespecified time for an interim analysis. The study enrolled adults with biopsy-proven NASH and generally focused on patients with either stage 2 or 3 liver fibrosis and a nonalcoholic fatty liver disease activity score of at least 4. Enrolled patients averaged about 55 years old, slightly more than half the enrolled patients had type 2 diabetes, and more than half had stage 3 fibrosis.